An ongoing task has been the re-housing of LHSA’s collection of glass plate negatives which relate to the teaching of Obstetrics at Edinburgh University from the 1950s to 1970s. 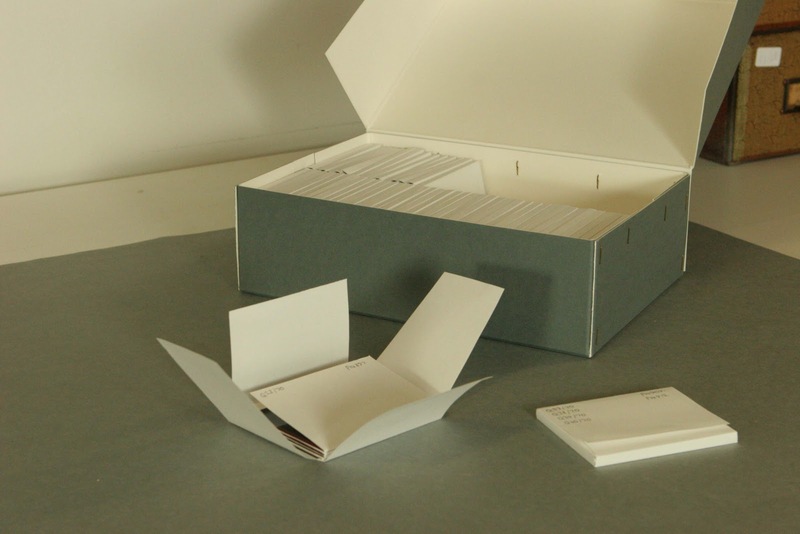 These were designed to be used with a lantern box to project the images onto a wall or screen. A small number are made from cellulose acetate film. The plates were originally stored in individual envelopes in wooden chests of drawers, which put them at a high risk of being damaged either from scraping against each other or being trapped at the back of a drawer. The paper the envelopes are made from is acidic and will corrode film emulsion over time. Additionally the chests are very heavy and awkward to move, again risking harm to the plates and injury to staff. Re-housing is carried out as follows: the plates are accurately measured and sleeves cut from Photon paper to fit them exactly. Each plate is assigned a reference number and all information from the original envelope is transferred to the sleeve. 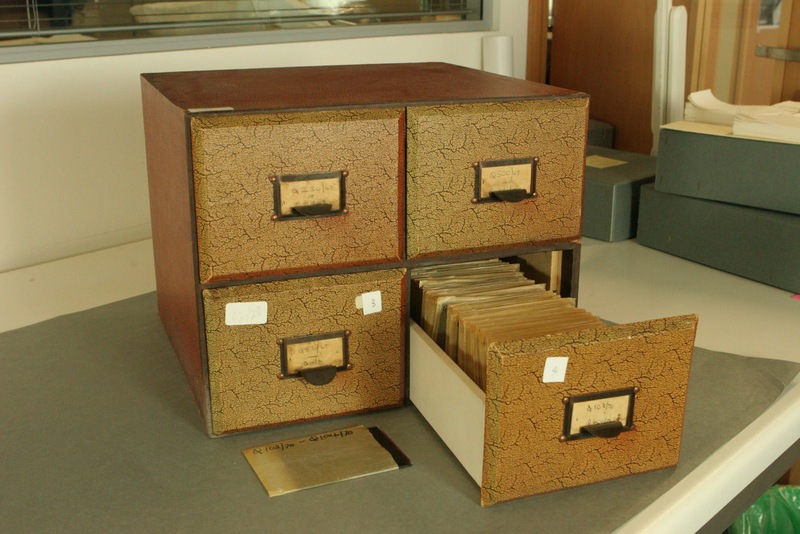 The plates are then put into 4 flap folders in sets of 4 and placed upright in archive standard cardboard boxes. The size of the boxes has been chosen so that when full they can be comfortably lifted. As a result of this re-housing, the plates are protected from damage and take up less space in the stores. 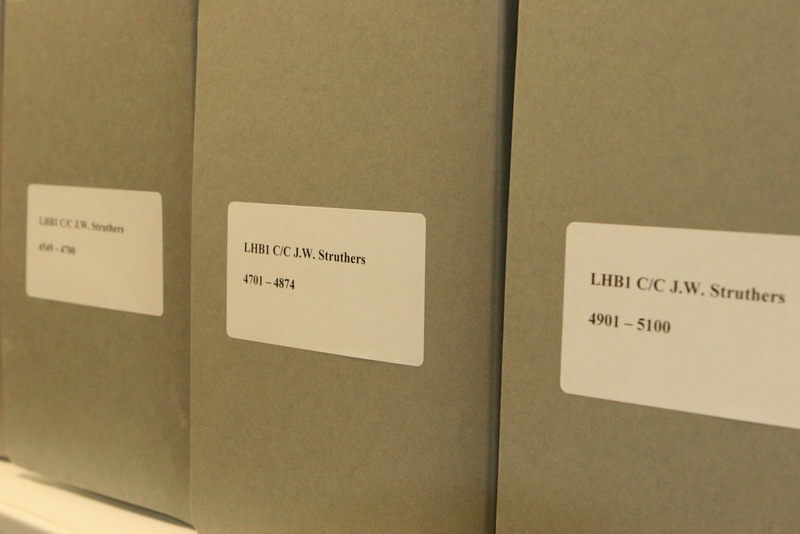 About 5,000 patient case notes from the LHB1 C/C JW Struthers series were recently requested for consultation by a reader. These case notes are 80 years old so access was subject to a successful application to the Director of Public Health. While Laura, the Assistant Archivist, did the necessary paperwork to ensure proper access according to current legislation (the Data Protection Act 1998), I made sure that the case notes were physically accessible. The case notes were in quite poor condition after they had been stored in folders that had caused a lot of creasing to the sheets. The case notes had also been used over the years so there was lots of tearing and surface dirt too. The case notes were surface cleaned and re-housed to ensure that they could be handled by the reader without causing further damage. It’s a labour intensive task but the end result is well worth the effort. I used the method for re-housing case notes that LHSA established over the course of several Wellcome Trust funded projects to re-house similar material. 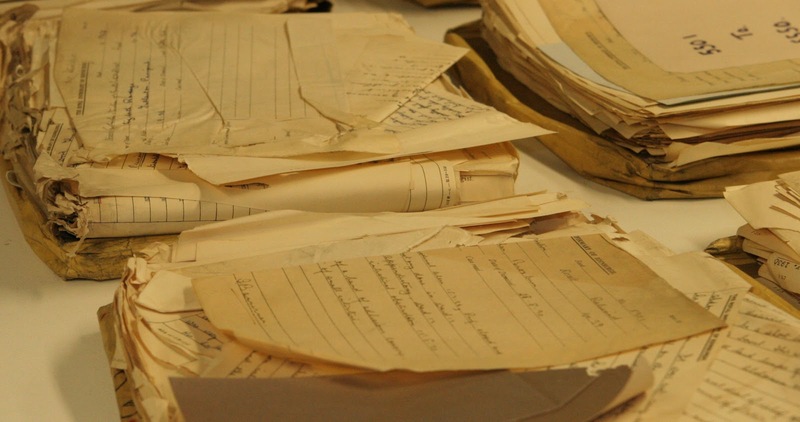 For more information about LHSA’s work to preserve our important case note collection please see our website. 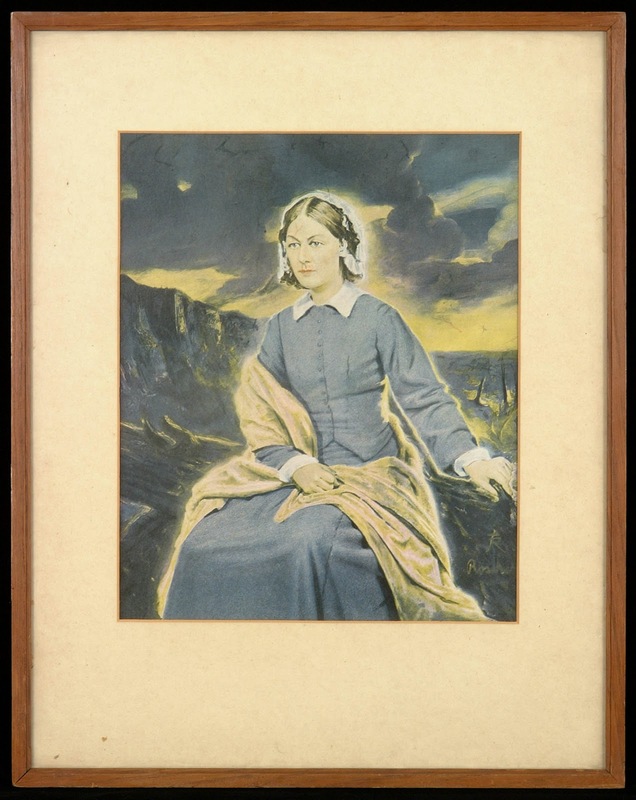 Original Florence Nightingale letter made available online. This week, Assistant Archivist, Rosie Baillie tells us about LHSA's prized volume of Florence Nightingale letters. 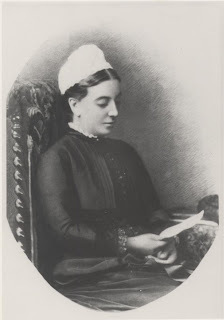 The Royal Infirmary of Edinburgh's Lady Superintendent of Nurses, Angelique Lucille Pringle was a regular correspondent of Florence Nightingale in the late 19th Century. This friendship resulted in a series of motivational letters addressed to the Infirmary's nursing staff written to inspire them to keep up their good work! One of the treasures of LHSA's Archive collection is a bound volume of letters written by Florence Nightingale collected by Miss Pringle. We have recently made the first letter in this volume available to view online using http://www.issuu.com/. This website provides online 'page-turner' technology, as shown below. Often I do wish that I could go amongst you all, at least twice in the year. I feel as if I were always with you in the work, and indeed I am always with you in prayer'. LHSA receives frequent requests from local history organisations, Women’s Guilds and others to give talks about the Archive and its records. This week I gave a talk to Portobello Local History Society where I used our Public Health records to build a picture of life in Portobello and Edinburgh from 1900 to 1950. More information on the Public Health Department of the City of Edinburgh. Edinburgh appointed its first Medical Officer of Health, Henry Duncan Littlejohn, in 1862. When Portobello became part of Edinburgh in 1896, responsibility for public health there fell under the jurisdiction of the Edinburgh Public Health Committee (PHC). It collected lots of information in its quest to improve living conditions and reduce disease; the annual reports produced by this body provide a fantastic snapshot of conditions at the time including birth and death rates, causes of death, and the results of inspections of public premises such as ice cream parlours. The records show that in 1900 the ward of Portobello East had the highest death rate of the entire city at 27.16 per 1,000. One of the PHC’s biggest concerns was the quality of the housing stock; up until at least the end of WWI, a large number of residents lived in overcrowded and dirty conditions in tenement buildings which contributed to the spread of infectious diseases such as tuberculosis. From the 1920s Edinburgh City Corporation undertook a massive building programme to move residents into more sanitary housing which helped to prevent illness in the first place and reduce the spread of infectious diseases that did occur. I discovered one of my favourite quotes that I’ve ever come across in the Archive in the PHC Annual Report for 1930 (pictured below). It likens housing stock to a gun, and the responsibility for its cleanliness to the person holding the gun! The talk was very successful and has introduced our records to a new group of people, several of whom are now enquirers using the records to conduct their own research.